I’ve tried a few keyboards designed for the iPad mini, but I’ve found that none of them aided my productivity enough to make them worth using with my tablet on a regular basis. 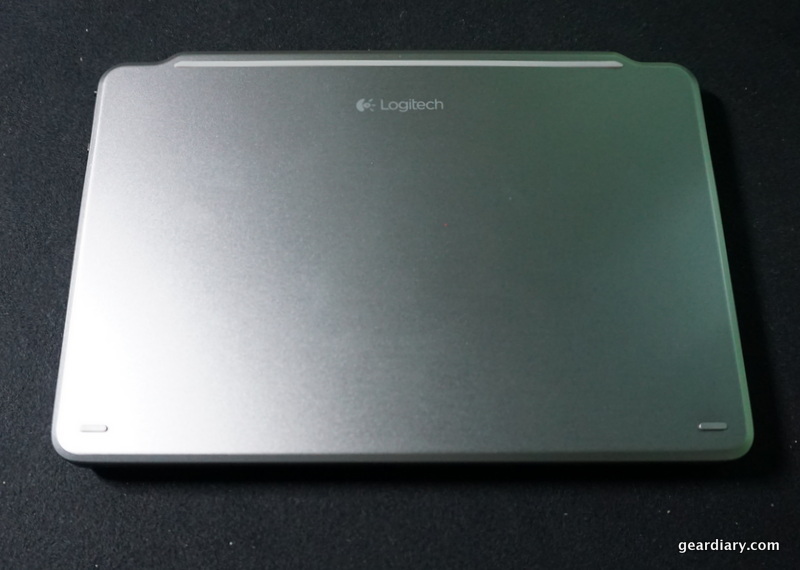 The Logitech Ultrathin Magnetic Clip-On Keyboard Cover for iPad mini is the latest.The keyboard cover is available in Space Grey and Silver, so you can get the keyboard cover that exactly matches your iPad mini. At just 7.86″ by 5.47 by 0.25″ and weighing under half a pound, the cover is small and light enough to take everywhere. Great typing: Improved layout and iOS shortcuts provide the ultimate typing experience. Familiar, fast and accurate. 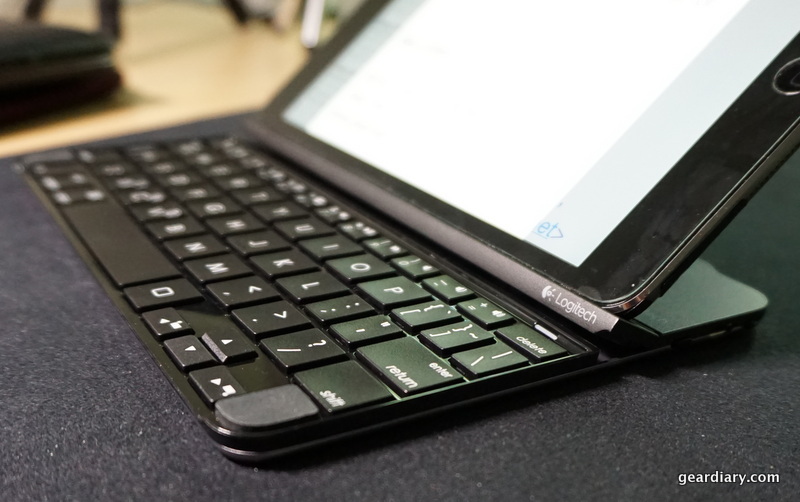 Thin and light design: This Bluetooth keyboard cover for iPad is only 6.4 mm thick and almost 2/3 the weight of iPad, thanks to its high-grade aluminum construction. Easily and securely attaches to iPad: Ultrathin’s magnetic clip is designed to be seamless and hidden while you are using the keyboard but ready when you need to attach to iPad. The keyboard is solidly built. There is no flex in the external shell– the portion that will be exposed when it is protecting the iPad’s screen — and very little flex in the keyboard itself. In all, despite the keyboard cover being as thin and light as it is, there is nothing cheap feeling about it. The side of the keyboard has a microUSB port for charging. It gets up to 3 months of use per charge, and it has a standard Bluetooth range of up to 30 feet. 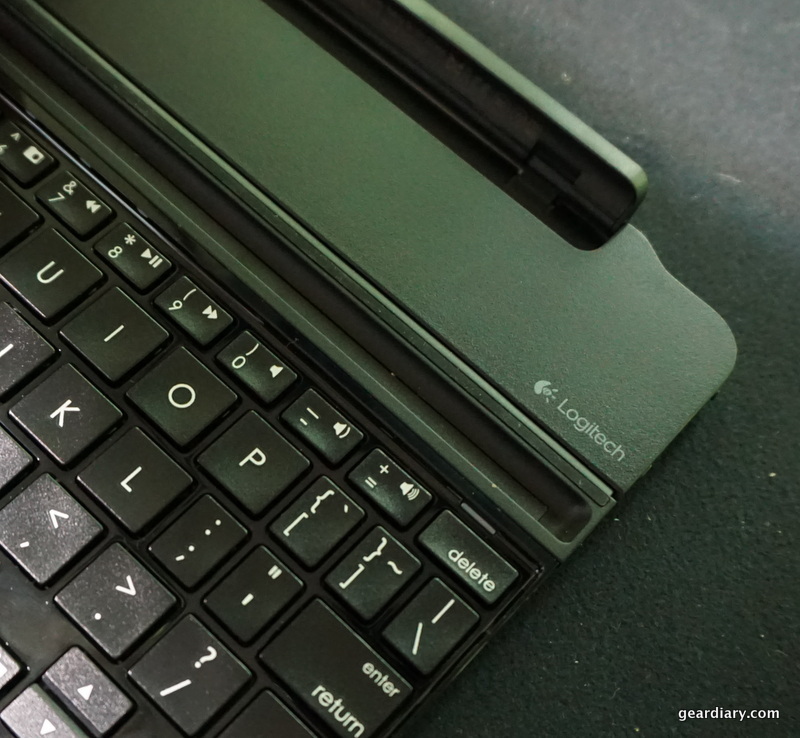 Behind the microUSB port is the button for pairing the keyboard to your iPad. In front of it is the toggle switch that turns the keyboard on and off. I do wish the keyboard had an automatic on/off function. 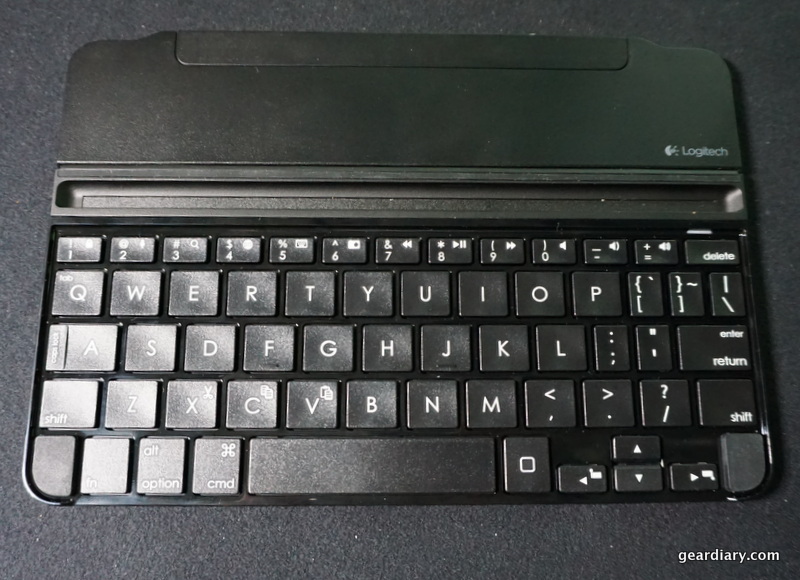 The back portion of the keyboard is a section that flips up and grabs hold of the iPad when the keyboard is being used as a cover. It does a nice job holding the iPad in place and, when the keyboard is being used as a keyboard, it flips down and out of the way. 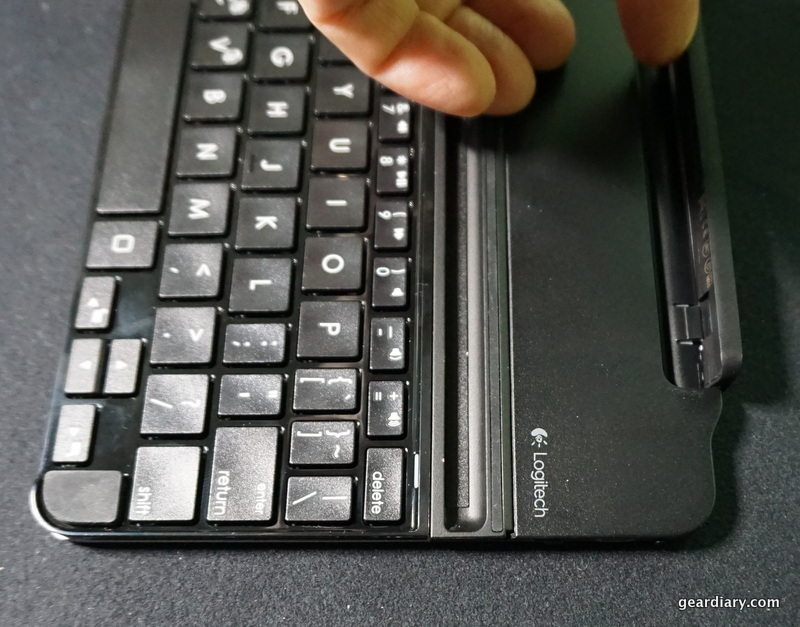 A previous version of the Logitech keyboard had a permanent hinge that grabbed hold of the iPad. It was always exposed and gave a less refined look and feel. A small rut just behind the keyboard holds the tablet in landscape. It automatically holds the iPad at a usable angle. With a bit of pressure however, the tray pulls up and offers a variety of viewing angles ranging from 50 to 70 degrees. It is a nice touch that makes the keyboard a bit more useful than it would be otherwise. The keyboard itself is just about as good as a keyboard this small could be. That may sound like a mixed compliment, and it was meant as such. There is no way a small keyboard is going to be as comfortable or intuitive to use as something that is full-sized. That means that, right out of the gate, this keyboard has some issues to address. Still, considering the fact that the keyboard is 1/3 smaller than the one upon which I am writing this review, it holds its own quite well. 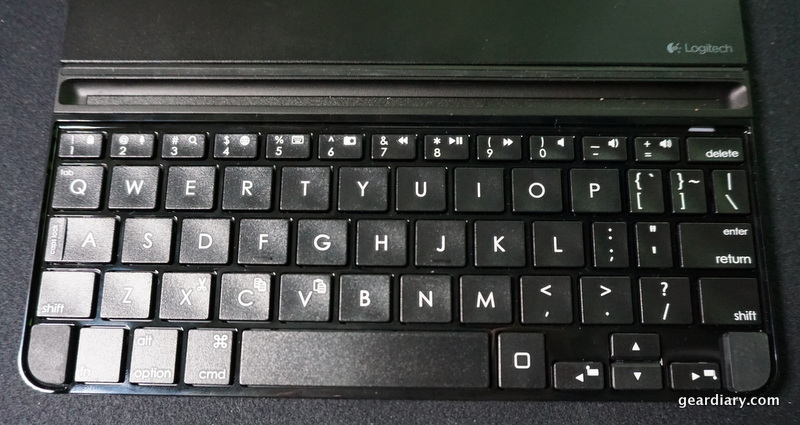 The keys are spaced tightly, but they are only slightly smaller than standard keys. And despite being small, the keyboard offers a full range of specialty keys. Sure, the special features are often doubled up on other keys and activated by holding Function and the button, but they are there and they do work. So while this keyboard isn’t my favorite, it is more than functional, and it beats trying to type on the screen. You can learn more and order yours here. 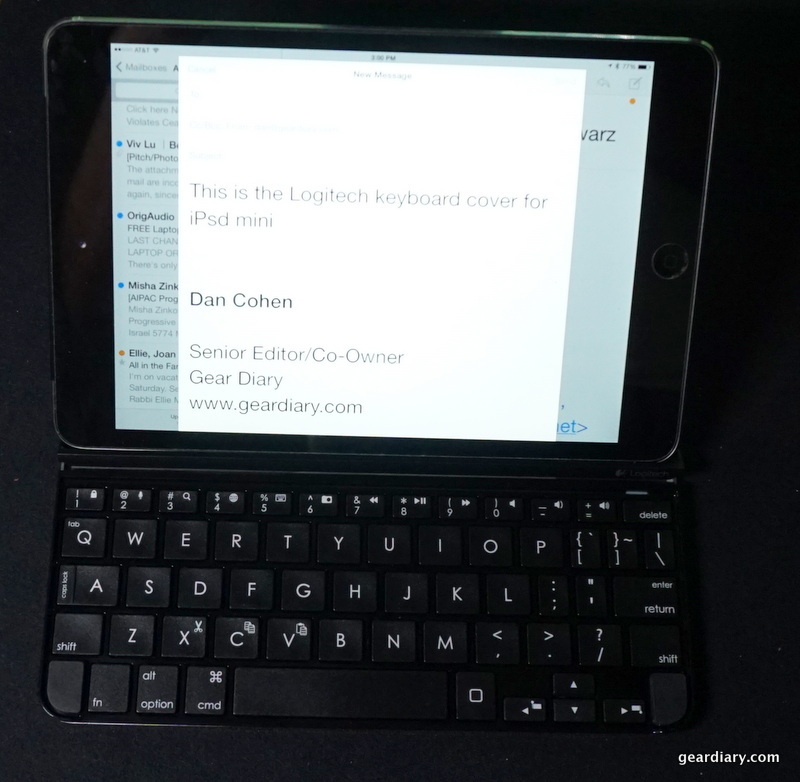 In all, the Logitech Ultrathin Magnetic Clip-On Keyboard Cover for iPad mini is an excellent accessory for your iPad mini. 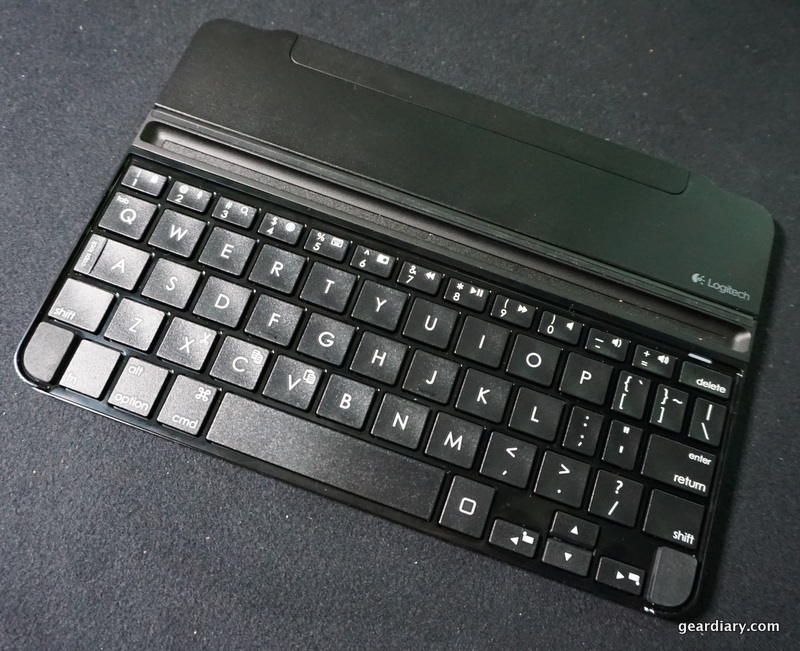 If you are looking to be more productive on the go, and you want a keyboard that is thin and light but still helps keep your iPad safe, then this is the keyboard cover for you. I know I’ll be using the review sample going forward!